Prof. Savas Alpay is the Director General of the Statistical, Economic and Social Research and Training Centre for Islamic Countries (SESRIC). He received his PhD in economics from Johns Hopkins University in 1997, and has taught at different universities in Turkey. Formerly, he has worked as a consultant for an international consultancy firm in the USA, and served on the Board of a Public Regulation Authority in Turkey. His research areas include interactions among economic growth, international trade and the environment with an emphasis on the design and implementation of policies towards sustainable growth in general. 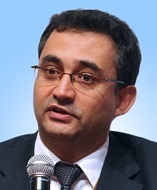 More recently, his research focuses on policies towards improving the socio-economic development of the communities, as well as the knowledge economics, science and technology policies and the vocational education and training programmes in the Member Countries of the Organization of Islamic Cooperation (OIC). Prof. Savas Alpay is also a member of the Turkish Academy of Sciences.